We offer state-of-the-art restorative care. We know that even when you do everything right, something can go wrong. If you are suffering from a dental problem, we are here to help with our many restorative dentistry options. Modern technology combined with the in-depth experience of our clinical team can assure you of a successful & long-lasting result. Whether the cause is accident or disease, we can restore your smile. Crowns cover & support a tooth with a large filling when there is’t enough tooth left. It can be used to attach a bridge, protect a weak tooth from breaking or restore one that’s already broken. A crown is a good way to cover teeth that are discolored or badly shaped as well, or to cover a dental implant. A crown can make your tooth stronger & improve its appearance. Call us today at 610-993-0444 for your appointment & more details! If you’ve lost teeth from decay, injury or periodontal (gum) disease, dentures are the restorative dentistry solution for you. Whether you need partial or full dentures, they’re essential not only to your aesthetics, but also your oral health. In addition to allowing you to eat as if you had never lost your teeth, dentures protect against facial sagging that would otherwise occur & give you a more aged appearance. Dentures will also promote your natural speech. Denture maintenance combined with a regular regimen of proper brushing can guarantee you’ll lead a more comfortable, healthy life. Please call Frazer Dental Care today to discuss if dentures are the right option for you! 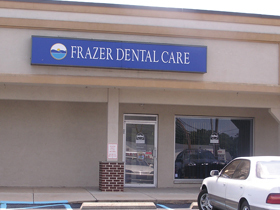 At Frazer Dental Care, we offer traditional & tooth-colored fillings. Tooth-colored material can be used both as fillings & to repair defects in the teeth. Because they are tooth-colored, it’s difficult to distinguish them from natural teeth. These fillings are often used on the front teeth where a natural appearance is important. They can be used on the back teeth as well, depending on the location & extent of the tooth decay. Bridges are custom oral appliances created by your dentist to replace missing teeth & restore your smile. Bridges are usually made to resemble your natural teeth, but can be made from a variety of materials, including porcelain, alloys or gold. There are several types of bridges that vary in both stability, application & cost. Removable bridges can be removed for cleaning but are not as stable, fixed bridges are cemented to the natural teeth on either side of the missing tooth gap, & implant-supported bridges use an artificial metal tooth root to attach the bridge to the bone of your jaw. Frazer Dental Care can recommend which type of bridge is best for you. With the CEREC System, getting a crown takes only one visit instead of the traditional three. After creating a scan of your mouth using advanced 3D imaging, the CEREC system creates a matched custom crown out of porcelain that can be installed immediately. Crowns in one visit means restoring your smile without taking extra time off from work or school. Call Frazer Dental Care today to see how Dr. Kesari can help repair your smile in one easy visit. Porcelain inlays & onlays are an excellent solution to cavity pain, reduced chewing strength & general degeneration of the back teeth. Onlays are generally a less expensive & more conservative alternative to crowns. Virtually indistinguishable from natural teeth, inlays & onlays discreetly restore teeth to an optimal state of health. They resemble natural teeth so closely that only you will know the truth. And now with the CEREC system, we can complete same-day inlays & onlays, avoiding the need to use temporaries, which can break, crack or simply fall off, making it even easier on your schedule.